This Community Member spotlight shines on Daniel Bayer, a Raiser's Edge, RENXT, Online Express, Target Analytics, and Blackbaud Merchant Services user, with Marymount Manhattan College.Daniel is also a Community rock star, Blackbaud Champion, and an RE Certified User. He's a great contact to have! This Community Corner spotlight shines on Raiser's Edge, RENXT, Online Express, Target Analytics, and BBMS user, Daniel Bayer, with Marymount Manhattan College. Tell us about your family (fur babies count!) "My 'household' is just me. My sister and her new husband live one borough away. They are both graphic designers and we constantly confab about various marketing pieces and web/email designs. Both parents worked in education - father as a teacher and then administrator, and mother as a school social worker." Where do you live? "New York, New York (a helluva town!)" What do you like to do for fun? "Go to the movies or the theatre." What’s a life achievement you are particularly proud of? "In my teens, I was a competitive dancer. At sixteen, I placed third overall in a national competition at Walt Disney World, and the studio I danced with were named "Grand Champions" for our overall performance." What’s one memory that always makes you smile? "Going out on Long Island Sound in my grandfather's boat every summer and picnicking on 'our' island. It wasn't really ours, but my grandfather found this perfect little hidden island that no one else ever seemed to go to, so we got to pretend it was our own private island kingdom." 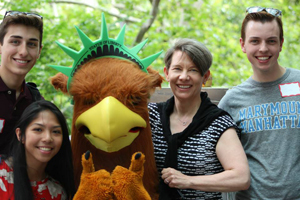 Tell us about your organization: "Marymount Manhattan College is an urban, independent, liberal arts college. The mission of the College is to educate a socially and economically diverse student body by fostering intellectual achievement and personal growth and by providing opportunities for career development. Inherent in this mission is the intent to develop an awareness of social, political, cultural, and ethical issues in the belief that this awareness will lead to concern for, participation in, and improvement of society. 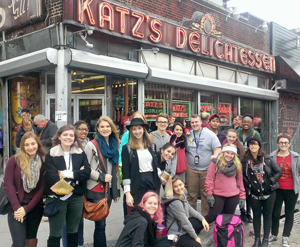 To accomplish this mission, the College offers a strong program in the arts and sciences for students of all ages, as well as substantial pre-professional preparation. Central to these efforts is the particular attention given to the individual student. Marymount Manhattan College seeks to be a resource and learning center for the metropolitan community." What’s a typical day like for you? "Turn on the computer, log in to Raiser's Edge. Print and distribute a gift report for the previous day so that the fundraisers know everything that came in. Inevitably answer questions about who some "mystery" person is on said report. Wait with baited breath for the mail to come. Enter new gifts and print acknowledgement letters for signing. Adjust any gifts our Business Office has issues with - or fight with them on those 'issues!' Work out a query for either our next big appeal or for our Major Gift Officers to sift through before their next big trip. Do whatever data health/cleanup work I can, while also checking the Blackbaud Community Forums to see if there's anyone who has problems I can help with (or to see if anyone else can give me help with one of my big issues!)." What’s the best part of your job? "I'm a huge statistics nerd, so I love creating reports and analyzing trends from year to year/fund to fund/appeal to appeal, figuring out what areas we need to improve on and where we have exceeded expectations." What advice would you give someone starting out in the non-profit field? "There are many different types of non-profits, and while they all tend to have similar underlying issues, each has their own flavor. Find one whose mission is close to your heart and even the bad days will still be rewarding. And ALWAYS take your full lunch break." What do you love about the Blackbaud Community? "Seeing all the different ways people come up with to work out similar problems, or even similar day-to-day processes. There is always something new to learn, and it might not only surprise you, but change your life!" If you had 24 hours before an asteroid hit ... what would you do? "If I had 24 hours left before the asteroid hit, I would book the first flight to whatever paradise I could find (first class of course, since the world's going to end), and set myself up on the beach, surrounded by nature in all its glory, to watch the end." I am with you on the lunch break thing. It is really important to take that break! Daniel, you totally nailed it on the lunch break advice! Keep doing what you do, man.